This ACE location is situated at the corner of N. Mt. Vernon Ave., and Palm Dr., within the confines of the Plaza Las Glorias Shopping Complex. There is plenty of free parking for customers. Bus line #1 of the OmniTrans stops at Mt Vernon and Palm Drive, conveniently in front of the store. Check OT’s website for more information. Since this location is in the Plaza Las Glorias shopping complex, a slew of eateries, markets, and shops are conveniently located within walking distance, including Cardenas Market, Donuts Ice Cream, Jack in the Box, Fashion Plaza, Fast 5 Pizza, and Dollar Tree. Looking for Affordable Auto Title Loans in Colton? Come to ACE Cash Express for an affordable auto title loan powered by LoanMart! When people run into financial difficulty, they may need emergency funds to help them turn things around. That’s what auto title loans powered by LoanMart provide; thousands of customers with poor credit have been able to receive funding, often up to $30,0001 in as little as one business day3. An auto title loan is different from a traditional loan. Borrowers use the title to a vehicle as collateral to obtain funds. And unlike traditional lenders, obtaining an auto title loan powered by LoanMart is possible despite a low credit rating due to qualifying factors like your income, your ability to make monthly payments on time, and your vehicle’s equity.1 Find out more details about auto title loans powered by LoanMart in Colton below. 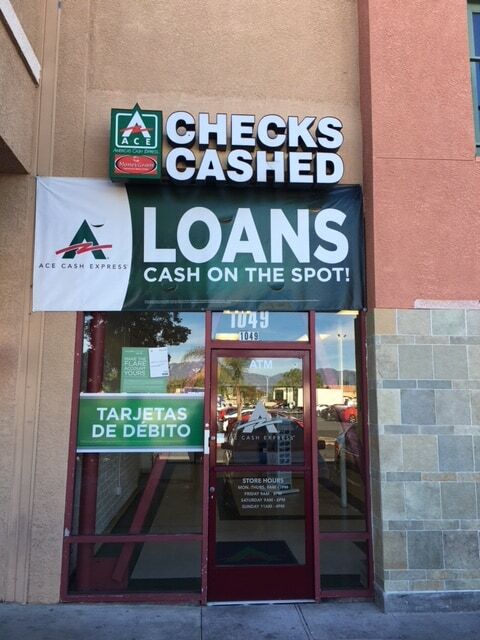 It is free to apply for an auto title loan powered by LoanMart in Colton at ACE Cash Express. Plus, there’s no obligation to accept the loan if you do qualify. Everyone deserves the opportunity to make an educated financial decision. Begin Applying for an Auto Title Loan Powered by LoanMart in Colton Today! Call the toll-free LoanMart line to speak directly with an agent. Click “Chat Now” for an instant connection with a representative during available hours. Once approved, your skilled agent will contact you and talk to you about picking up your funds at ACE Cash Express!